L68VB-WSA – WaterSaver Faucet Co. 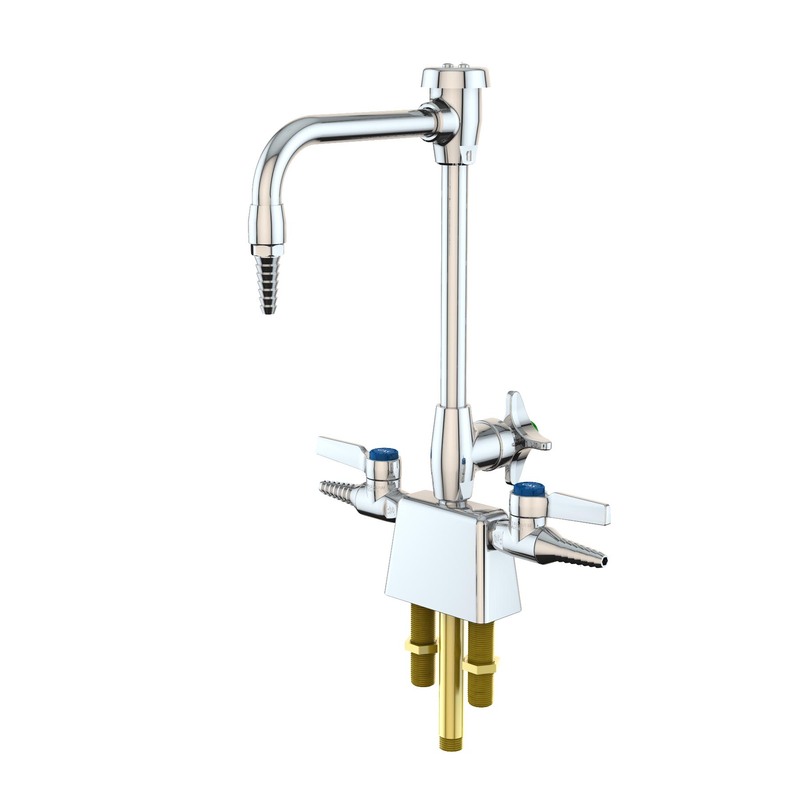 Application: Deck mounted fixture for cold water and gas, air or vacuum. Fixture has three inlets, so valves may be used for different services. Base and Valve Body: Forged brass. Valve Unit: WaterSaver self-contained compression valve unit with replaceable stainless steel seat. Handle: Forged brass four-arm handle with color-coded index disc. Gooseneck: 6″ rigid gooseneck with 3/8″ IPS female outlet and removable anti-splash serrated hose end. Vacuum Breaker: Integral vacuum breaker to prevent backflow. Vacuum breaker has replaceable seat and ultra-light float cup to resist spilling at low flow. Ball Valves: (2) laboratory ball valves for gas, air or vacuum service (specify service when ordering). Valves may be used for different services. Valves are forged brass with lever handle and integral seven serration hose end. Inlets: (3) 3/8″ NPT male inlets. Furnished complete with locknuts and washers. Note: If vacuum breaker is not required, delete suffix “VB”.